If you're looking for a men's wedding band that is unique and perfectly fits your personality, consider a bespoke design. These custom-made rings are perfect for guys who don't want to blend in with the crowd. Stephen Einhorn - Einhorn's previous designs range from elaborate pierced metal rings to bands set with exotic wood, diamonds, and sapphires. He also works with glass enamel and engraving, and many of his pieces feature unique shapes and motifs. Gemvara - This semi-custom jeweler allows customers to choose the gems and metals for their wedding bands. You can select from dozens of designs, which range from contemporary to classic. Then you can customize the design to your liking. Bliss Rings - This United Kingdom-based ring company offers a range of customizable men's wedding bands, as well as free bespoke ring design services. Bliss provides a lifetime guarantee on the ring, which can give you a little extra peace of mind. Krikawa - This custom jeweler specializes in mokume gane rings and other unique designs. You can choose the style you like, and then customize the ring with precious metals, gems, and other modifications. Dennis & Lavery - This jeweler offers both exclusive stock designs and custom-made wedding bands. Past men's designs include platinum bands set with tiny black diamonds, pierced wedding bands, and other unique styles. While working with a company that specializes in bespoke rings is a great way to get a custom design you'll love, buying a ring from an individual artist is another excellent option. You can buy custom men's wedding bands online from artists on marketplace sites like Etsy.com or Artfire.com. You can also find a jewelry artist in your area by contacting local colleges and universities. Often, the art department at these institutions will have a list of jewelry design students or past graduates who specialize in custom work. Local galleries may also offer recommendations about specific artists. View some of the designer's previous work. It's important to choose a designer with a style you really love. Although your ring will be unique, it will have some style elements in common with the jeweler's past creations. Ask for references. A wedding band is an important purchase, so it's a good idea to talk to past clients. Make sure the previous customers loved their designs and the experience of working with the bespoke jeweler. Have a conversation or two with the designer before you get started. 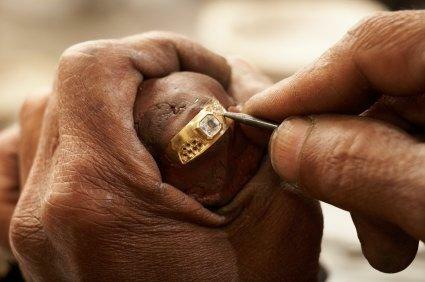 To order a bespoke ring, a client must work very closely with the jewelry artist to come up with the perfect design. Make sure you like the designer's personality and can work well together. Know your style. Before you begin the process of ordering a bespoke wedding ring, make sure you have some ideas about what you want. Make some sketches and brainstorm a few ideas to help you clarify your needs. Ordering a bespoke wedding ring takes a little more thought, money, and time than buying a mass-produced design. However, if you're looking for a men's wedding band that is uniquely yours, the end result will be well worth it.